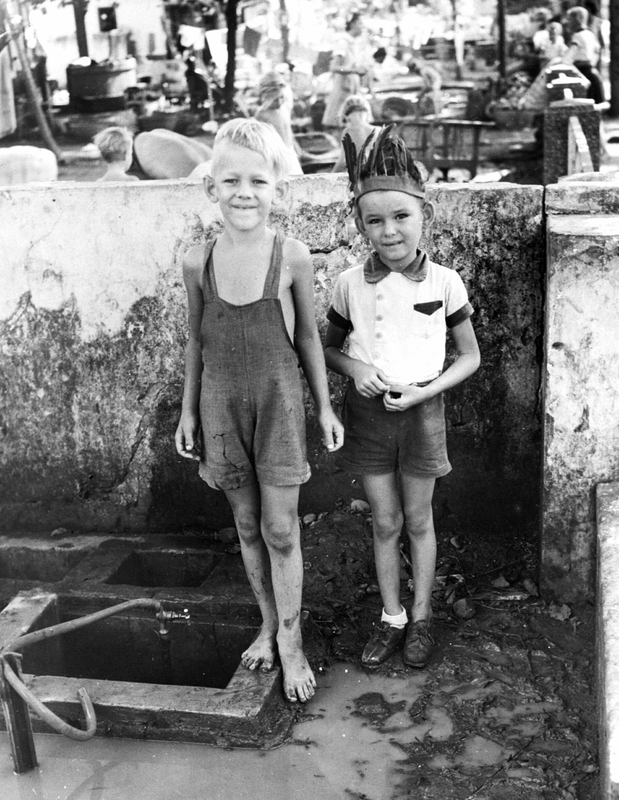 About twenty Bandoeng Camps were in existence during the Pacific War. Of these by far the biggest and most important was the Tjihapit women’s and children’s camp. 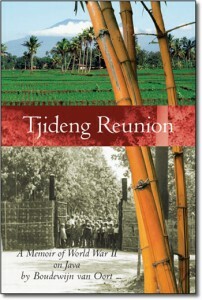 This camp is described in detail in the book Tjideng Reunion. Providing this overview, from its start until its final end in May- June 1945, was made difficult by the lack of coherent documentation. The author was able to interview a number of camp survivors and gained access to unpublished diary fragments and one diary, kept for most of the camps existence by a teen age girl as well as a fragment of the list of internees. Even less information is available for the other Bandoeng Camps. No lists of names of internees have for instance survived. Their inmates were gradually absorbed by the Tjihapit camp in the case of women and children, while the men and boys, ten years and over were dispatched to Tjimahi , the garrison town ten km west of Bandoeng. Tjihapit was the biggest of the Bandoeng Camps for Women and Children in South East Asia. 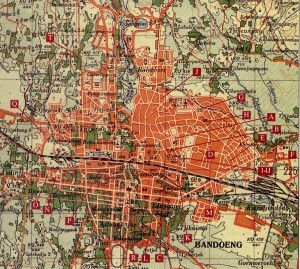 It began as a suburb in northeast Bandoeng ( today’s Bandung) from where all non-Europeans were evicted at short notice.Â From the Bandoeng address book it is possible to obtain an impression of the number of families affected and their likely ethnic composition. The term “non European” at this stage meant anyone with clear Allied, family composition. Gradually family members with Axis connections, Jews , and Eurasians got interned here. With time the density of home occupancy grew to 30 persons per single family dwelling. The peak number of internees is estimated at about 14,000. During the early stages of occupation older European men who had missed the initial round up along with female and child family members were herded together into Tjihapit. Periodically until about early 1944 old men and teenage boys were removed, but after October 1944 a camp liquidation process was started, with women and children transported to various other camps in group of about 600. This process was accompanied by very strict control over personal possessions. Virtually all personal documentation such as passports and birth certificates were lost, and the amount of personal possessions that could betaken along was limited to 20 Kg, including such household items as eating dishes and cups . The destination and purpose of this movement of people was never made clear and it was widely rumored that we would all be sent to the jungles of Borneo to fend for ourselves. 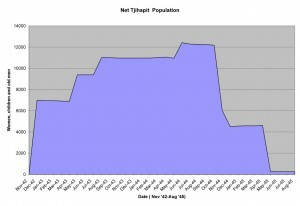 The graph depicts “net population” to factor out the removal of older men and boys between the ages of ten and 17. The peak population between May 1944 and October 1944 occurred when two other internment camps in Bandoeng -Karees and Bloemenkamp, ere evacuated . At the end of the war most of the interned civilian men were located in Tjimahi, 16 km west of Bandoeng and the women were imprisoned either in the Batavia ( Jakarta ) area or in mid-Java. 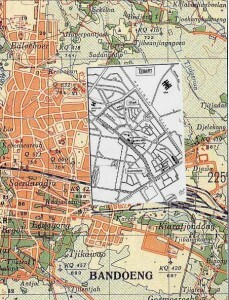 On the accompanying map are indicated the location of some principal additional Bandung camps as listed in the Geillustreerde Atlas van de Japansche Kampen in Nederlandsch Indie 1942-1945 (Asia Maior, Nov 2000). These camps are mentioned in the book, Tjideng Reunion, in the context of describing the internment process that the Japanese army implemented after March 1942. Bloemenkamp: This was the south western extension of Tjihapit, housing women and children until Dec 1944 when they were moved to Tjihapit. Afterwards the camp housed boys. LOG (F): Before the war this had been a borstal. It housed in succession , POWs, civilian men, and after April 1944, once again POWs after the civilians had been moved to Tjimahi. Laurens van der Post describes life in this camp, somewhat embellished with respect to his own role , during the final months of the occupation. Karees (M): This camp served for a while to accommodate families where the men were deemed to provide essential services for the administration of Bandung. By December 1944 The men, boys, women and children had been moved to separate camps. All told there were some 20 Bandoeng camps , most of them used during the initial phases of de-europeanization drive of the Japanese army. A brief description of the population leadership and military supervision can be found in the the Kamp Atlas. 6 Responses to "Bandoeng Camps"
My mother was in Tjihapit with her mother and 3 siblings. My grandfather was a POW. I have MANY artifacts in my house from this period. Dog tags, papers in both Bahasa and Dutch. My family repatriated in 1950, when the Dutch and the Belanda-Indo had to leave. thank you for your comment. You are aware that I have some name lists from Tjihapit, as well as the Bandoeng addres book. Some folk are curious to obtain information. I will shortly post a revised copy of the address book on my website. My father was Japanese prisoner of war at Cycle Camp Batavia. In his memoirs he also talks about Bandoeng Camp. He has written a long story of his years 1942 to 1945 as a P.O.W. He mentions working at Tasik Malaja Airfield and Djockakarta Airfield. Did your father go as a Dutch “volunteer”from South Africa?